Colombia President Juan Manuel Santos visited the French embassy in Bogota on Saturday to express his country’s “infinite solidarity” with France after Friday’s terrorist attacks in Paris. Santos improvised a visit to the embassy to sign a condolence book for the 129 who were killed when terrorists opened fire and exploded bombs in the French capital. “France has been a country that in our entire existence as a Republic has been on our side. It has been a befriended nation in every sense,” the Colombian head of state said. According to the Colombian president, he talked to his French counterpart, Francois Hollande only moments before the attack to ask for France’s help to monitor and verify a pending ceasefire with FARC rebels who for decades have been at war with the state. 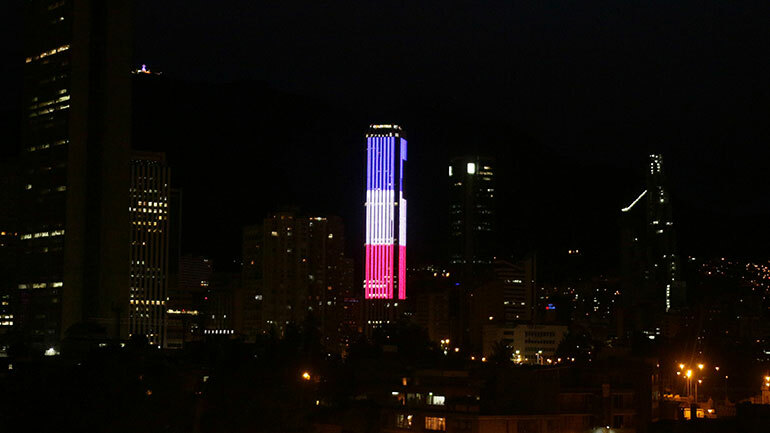 In another show of solidarity, Colombia’s tallest building, the Colpatria skyscraper in Bogota, was lit up in the French blue, white and red. The post Santos expresses Colombia’s ‘infinite solidarity’ with France after Paris attacks appeared first on .